WATCH A VIDEO of opening this kit - on bestfirstaidkit.com Ever wish you could really get a good look at an item before buying it online? Well, this is the next best thing than opening it yourself. Be sure to watch the whole video because at the end we put extra personal meds in the case. See for yourself and check out the intentional roominess! Most-Often Needed First Aid Items - Not filled with items you will never ever need like tons of adhesive strips and individually counted cotton balls. A CPR face shield with built in valve, burn gel, Mylar Emergency Blanket, triple antibiotic cream, splints and more. You won't open it up to find it only filled with adhesive strips and individually-counted cotton balls. Medical-Alert Red Colored Bag for easy identification. You want a bag that is EASILY spotted by anyone in an emergency situation, even if a foreign language from yours. Everyone recognizes the medical - alert red because red "stands out" from other colors. This is the essential item you hope you will never use. For years I’ve been assembling first aid kits for myself, friends & family, and I’m always disappointed with the ones available. They either mostly contain band aids, or enough inventory to supply a small hospital Mash unit! So I created this Best First Aid Kit; This is what I recommend everyone START with. I then recommend you add your own personal meds. That’s why I made a “roomy” case – with enough room to hold your meds too! This kit meets real-life needs of travelers, homes, RV, dorm rooms, & many others. Understand though that this kit is not intended to be a comprehensive survival kit, nor is it everything you need to prepare for natural disasters. 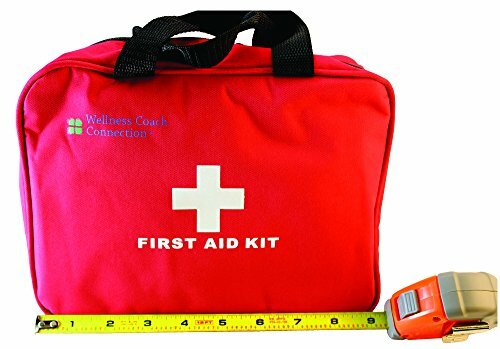 It’s a great first aid kit based on my experience, with items & features you may not have otherwise thought of. – Also makes one heck-of-a-nice gift! If after evaluating this kit for 14 days, if you are not happy with it, you may return it with a full guarantee. Chances are if you walk away from this offer you will forget, & you won’t have it when you need it. Murphy’s Law states that “Anything that can go wrong, will and usually does”. Being prepared can save an outing, or may even save a life. Click the button at the top of this page to protect yourself & your family now!